Another large group of deer nearby remain almost unseen in the shadows on a small hillside. 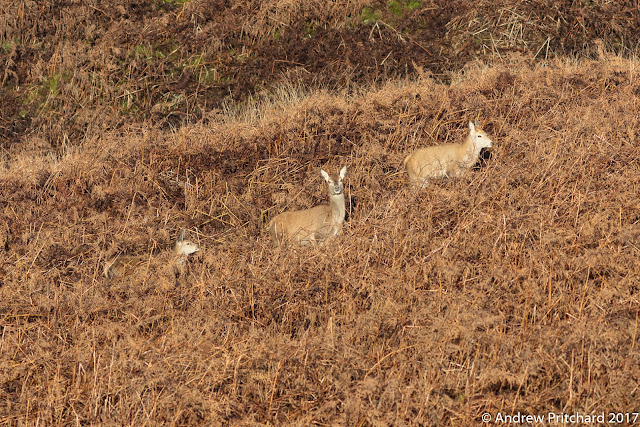 This is a group of hinds with a stag, who also seems to have gathered a large harem. The rut has been active for two months now, and it must be hard work to watch over so many hinds, waiting for the right moment to mate. A small group of deer in heather. 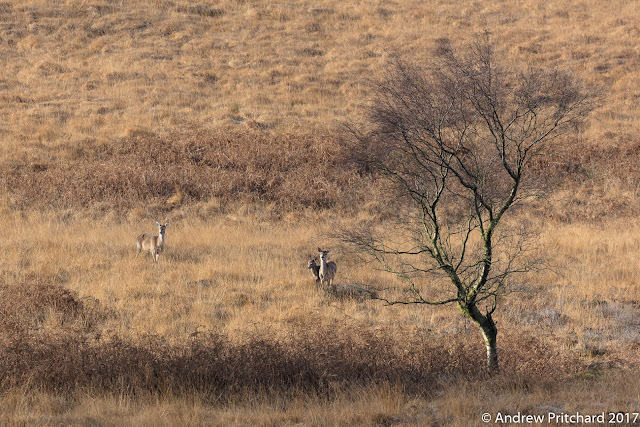 Two hinds appear to be having discussions about something, and they don't look very happy with each other! 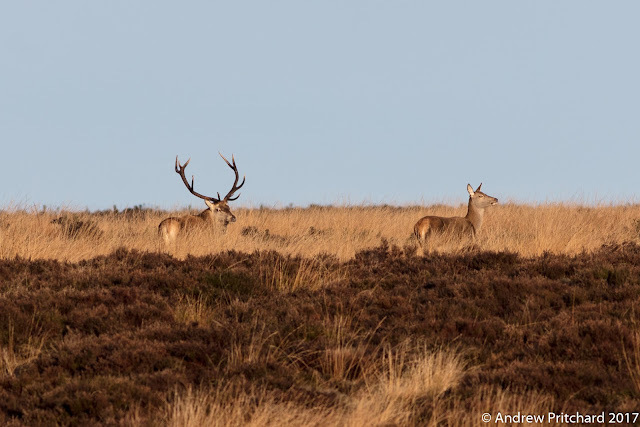 It is not only stags that develop a social hierarchy, which is manifest most clearly during the rut. 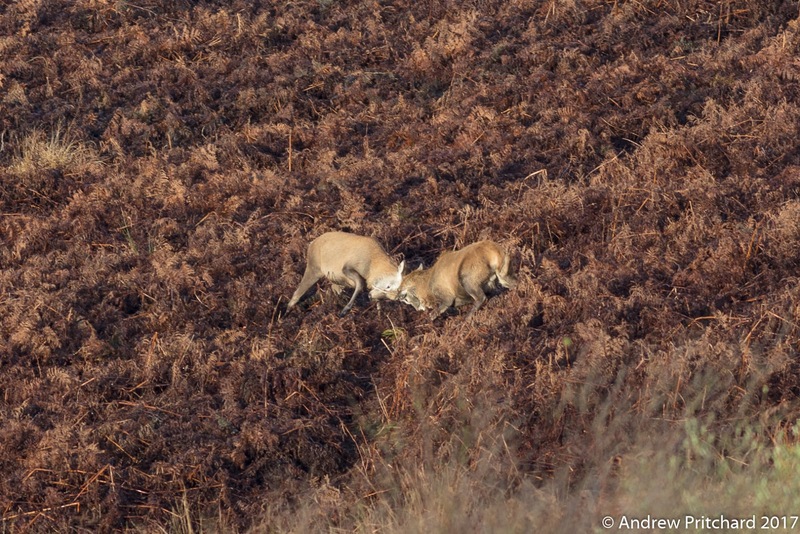 The hinds also have dominant and submissive members in their groups, and arguments do break out. A stag with one antler stares across the moor, with the sun lighting his pale face. 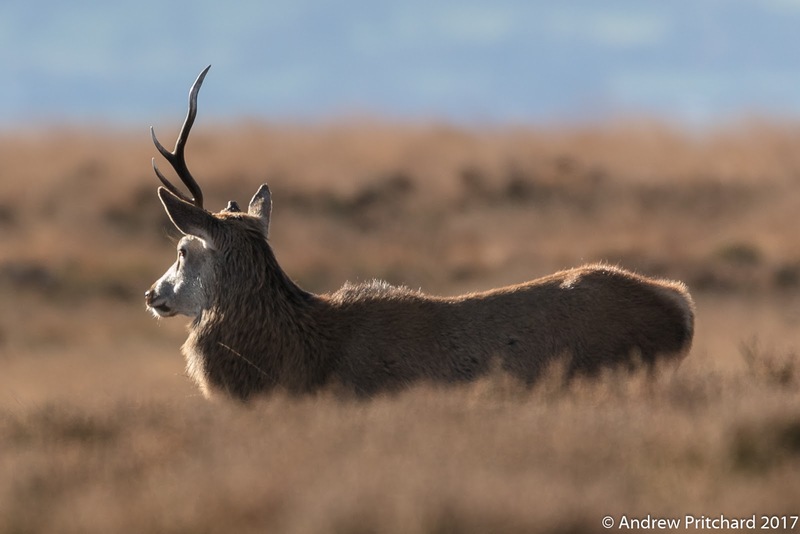 This stag looks quite old, with one antler broken off, perhaps because the antlers are not strong enough to stand the rigours of the rut any more. His white face and whitened antlers also might indicate age. 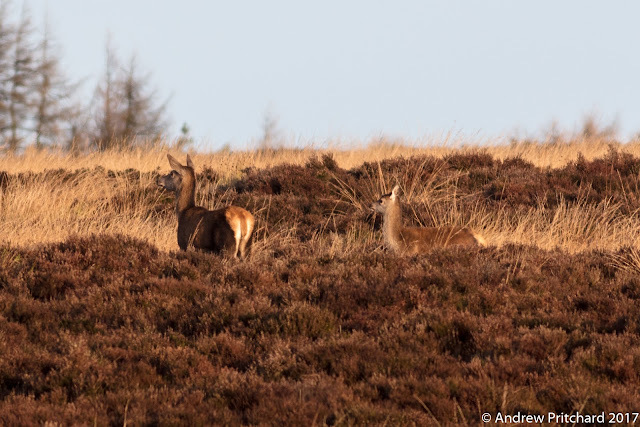 He appears to be with a small group of hinds away from the main harems on the moor. From the front, the stag looks unbalanced, perhaps he can feel the extra weight on only one side of his head. He clearly shouldn't get into any fights with a single antler. Any opposing stag would very quickly damage him if it came to a clash of antlers. The stag with single antler leads his small group of hinds towards something interesting. 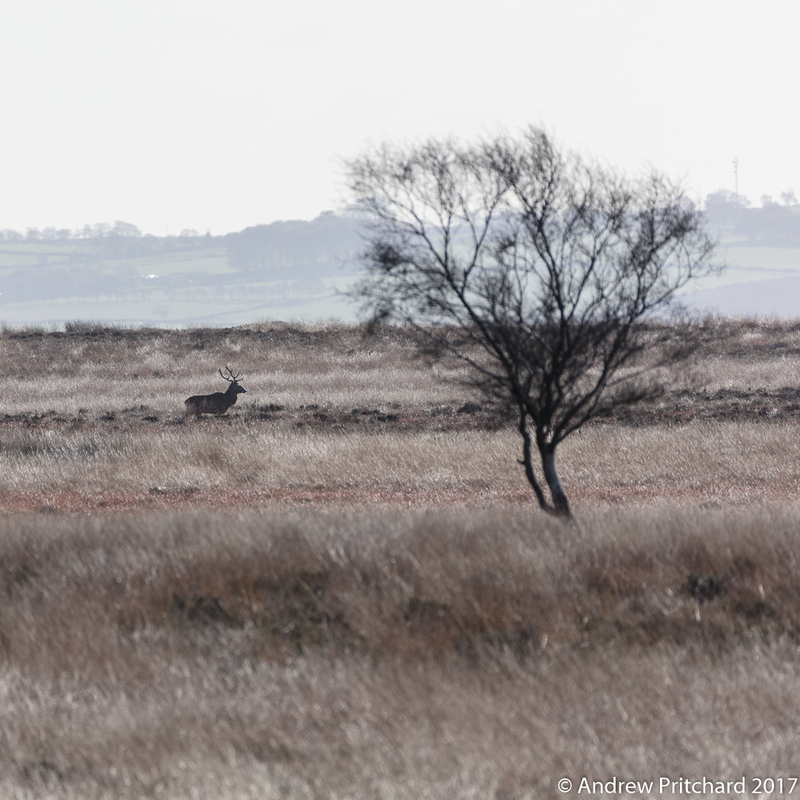 This group appears to consist of a small number of hinds with what looks like a young hind in it's first or second year. It may be that these hinds also want to keep out of the way of the fighting stags, preferring a quiet life away from the action. 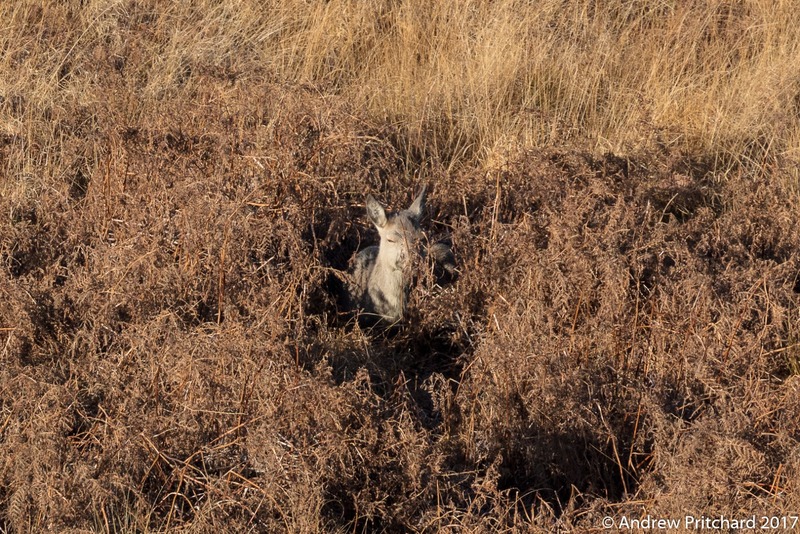 Hinds and calves can and do sometimes get injured during the rut. Walking through the long grass. 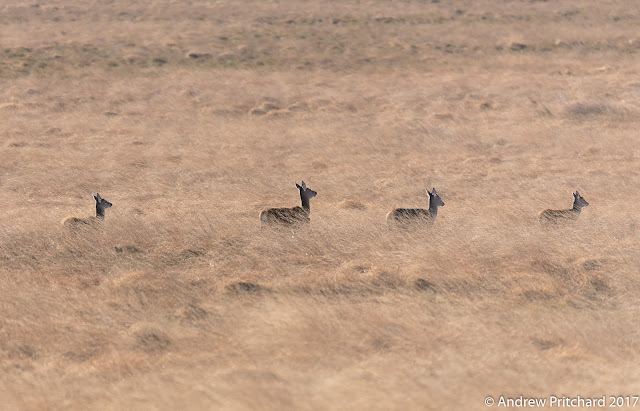 Four hinds are walking in single file through the long yellow moorland grass. The moorland here is characterised by large areas of this dominant grass species, punctuated by stands of heather. On windy days the wind whistles through these grasses, creating a strange whispering. One of the advantages of very few trees up here is the possibility of hearing the grass in the wind. 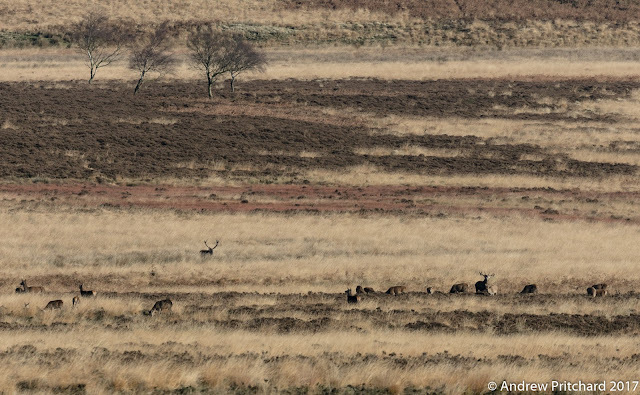 The larger group of deer alters course, to head away from the footpath deeper into the moorland. In this wider field of view, areas of grass and heather can be seen intermingled in the distance. There is no bracken up here, with the heather seeming to prefer drier stony ground, and the grass the wetter areas. Bracken also prefers better drained ground, but is most often found blanketing hillsides, where drainage is very good. 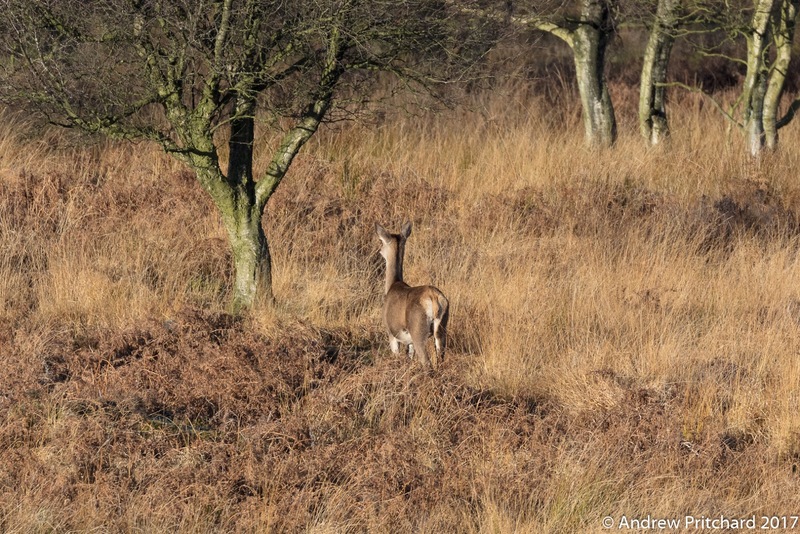 A young hind stands staring through the trees, listening to something. A small group of deer appear to have slept amongst the bracken in this clearing in the trees. This young hind can hear something through the trees, but perhaps can't see it, and so is concerned. 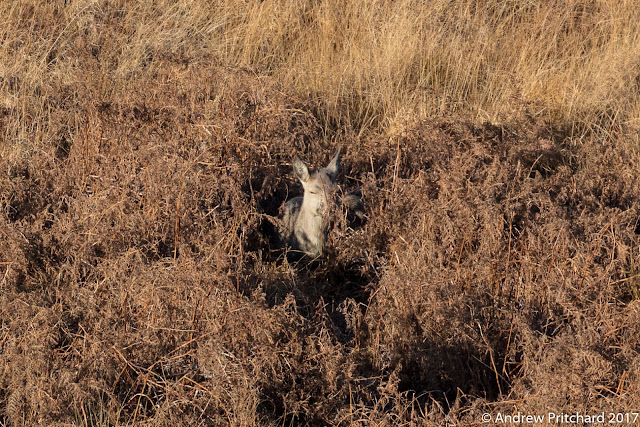 Another hind nearby is still waking up from her bed of bracken, still lying down and squinting in the morning sunlight. She appears to be part of the same group, but they seem to like sleeping singly. It is possible to find large areas of bracken that have either been flattened or already have cleared areas in the dense stands of vegetation. It must feel safe and comfortable, not only to be hidden by the surrounding plants, but also to have an area of softer perhaps drier ground on which to lie. 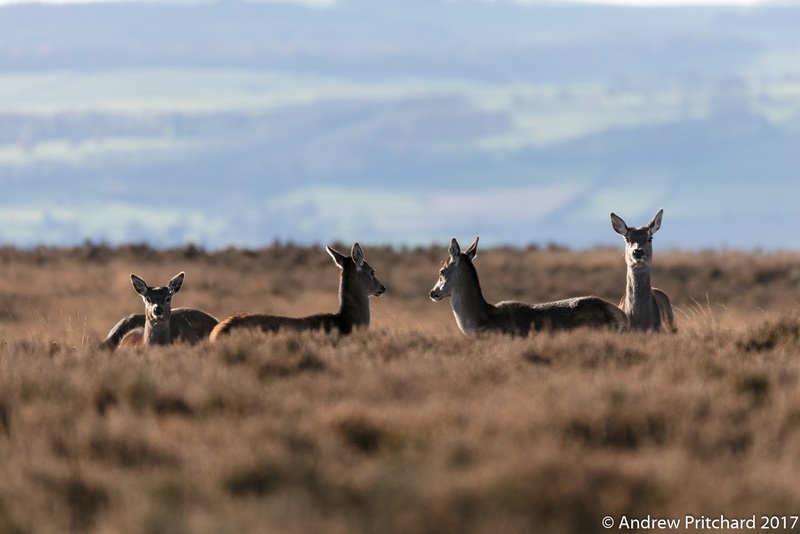 A small group of deer stare up to the higher moorland, looking for a way past the human's footpath, which is already busy with activity. Even though there is a lot of grazing in the lower wooded and open areas nearby, the deer seem to like heading up onto the higher moorland to feed on heather as well as grass. 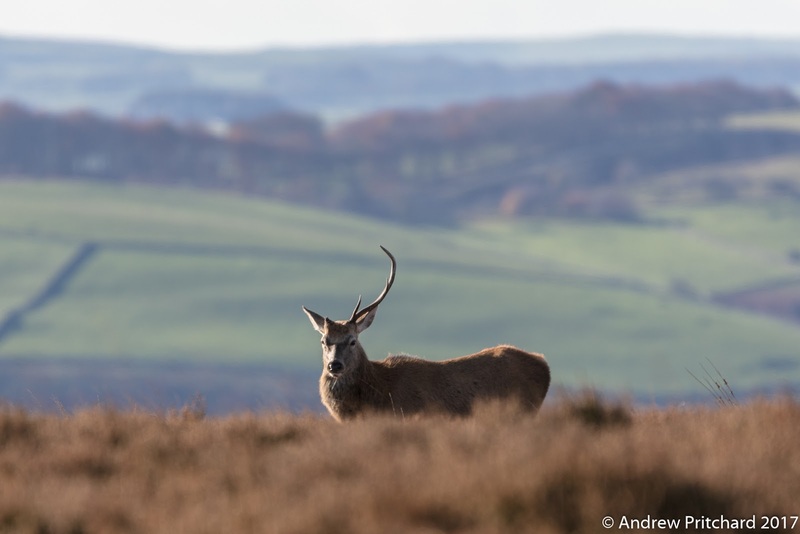 A lone stag walks across the higher moorland, which looks bleached in the morning sun. In this view the various areas of heather and grass growth can be seen. It appears that again the heather prefers higher and probably drier ground, where outcrops of stoniness help with drainage. The yellow grasses fill in between where the ground is likely to be wetter, with the reddish grass dominating at the low point of probable maximum wet. A hind and calf, quite likely mother and offspring, look towards the footpath with the sun behind them. 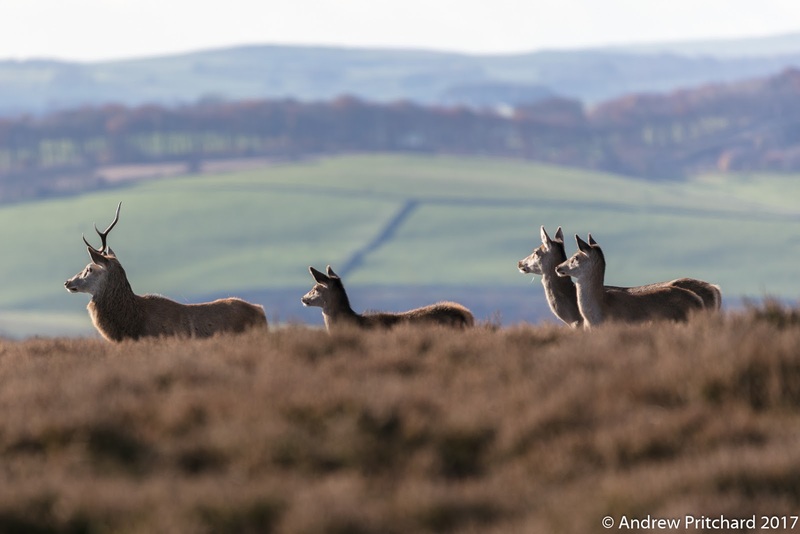 They can probably see a person or persons with or without a dog or dogs walking close by along the public footpath across the centre of the moors. The calf looks quite concerned, with it's ears pointing backwards, the mother listening intently to what is going on with ears pointing forwards. Stag and hind in early sunlight. A stag and hind checking out the moorland towards the rising sun. The deer are ever vigilant to any threats that might be approaching. Most of the time they will be quite safe, but the occasional dog might chase the smaller members. Due to the lack of natural predators the deer must also be culled, otherwise they would multiply out of control and tend to eat everything available. White ears, eyes and chin. 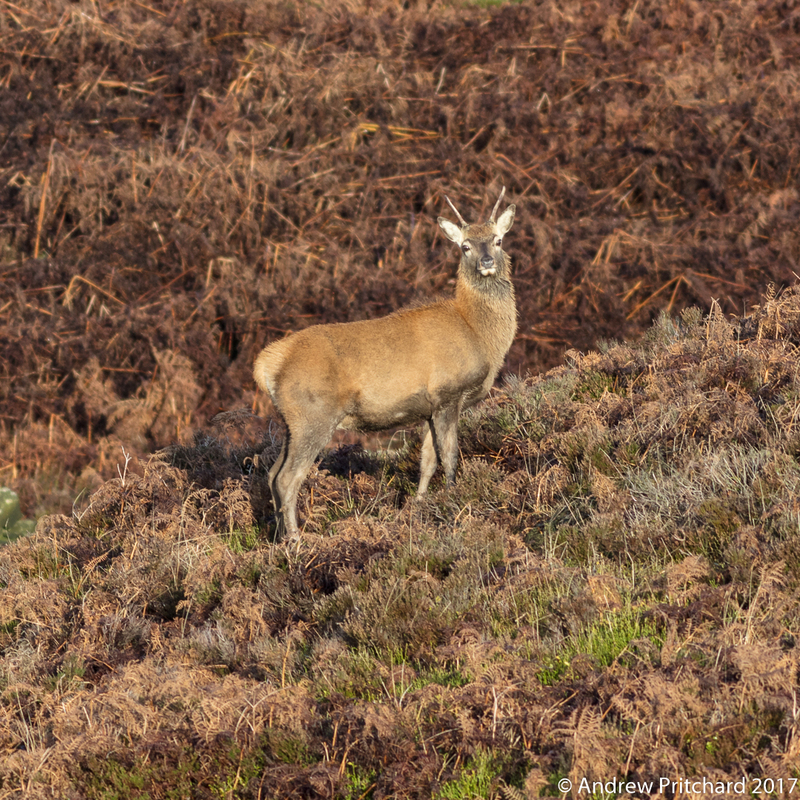 A brocket stands in some dead bracken. Most of his coat is well camouflaged except for his ears, eyes and chin which stand out brightly against the surrounding browns. 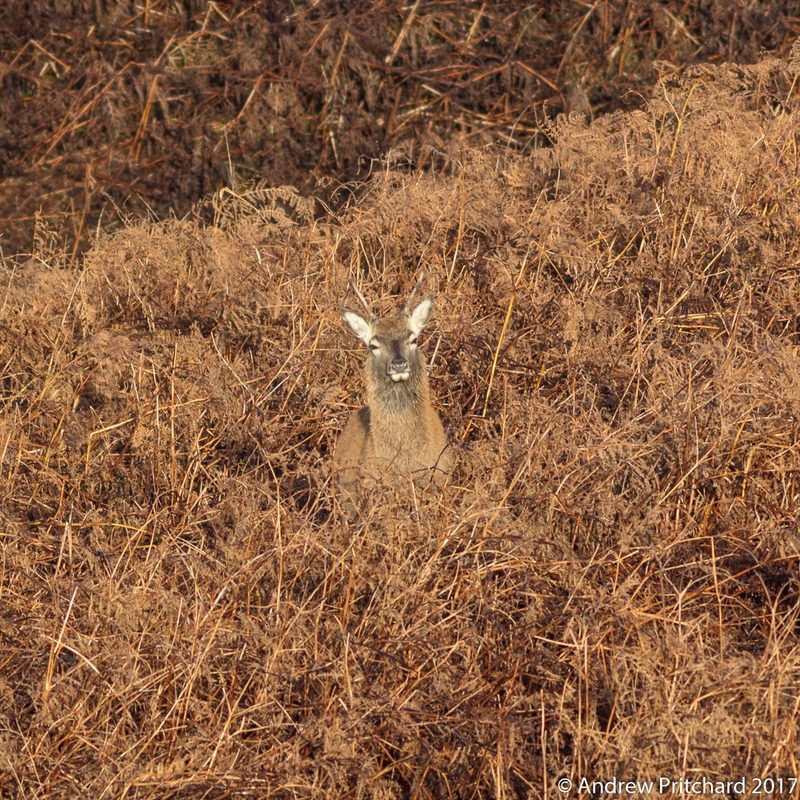 He looks quite serene, safe in the knowledge that he is invisible in the bracken! This would be true if he were to lie down, but staring at the camera like he is makes him very obvious. Moving up to the moor. The same brocket is moving up towards the higher moorland, and is now standing amongst a mixture of heather and dead bracken. It appears he has been wading through a wet or muddy area. The wooded area below the moorland does not have any footpaths crossing it, and perhaps this is why. The higher ground drains both with surface run off, which can be seen in a number of small streams that flow directly over the edge into the woods, and springs which add to the water flow below the edge. Two very young yearling males appear to be fighting. Even their small single tined antlers could be dangerous, possibly more so than a full set. With the singles tines there is nothing to catch on the opposing antlers, unlike the stags with a full head of times we have seen in previous months. This means that the young ones here are skull to skull, and any small antlers must be dangerously close sensitive parts. Moving away from the trouble. 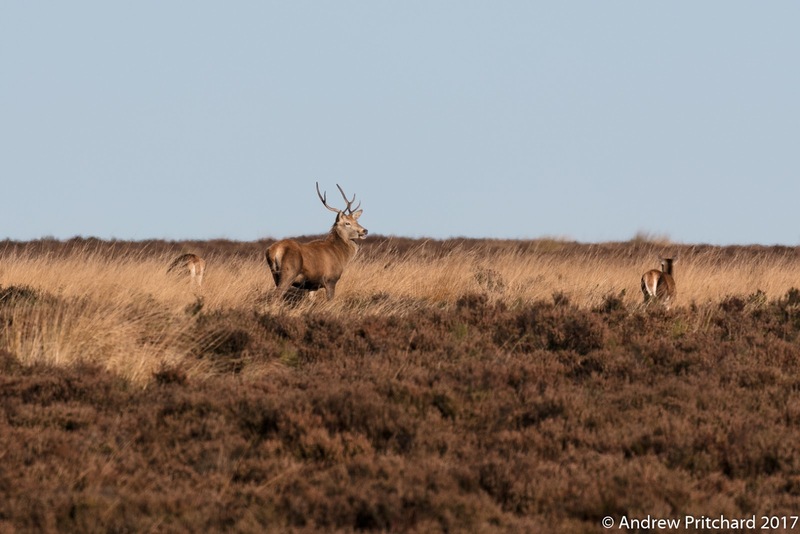 A hind and two calves also move up towards the higher moorland. It seems to be very much the route, to head up from the woodlands onto the moors above via this defile like valley. The deer have some favoured routes along which to travel, and this fault controlled landscape appears to be a firm favourite. 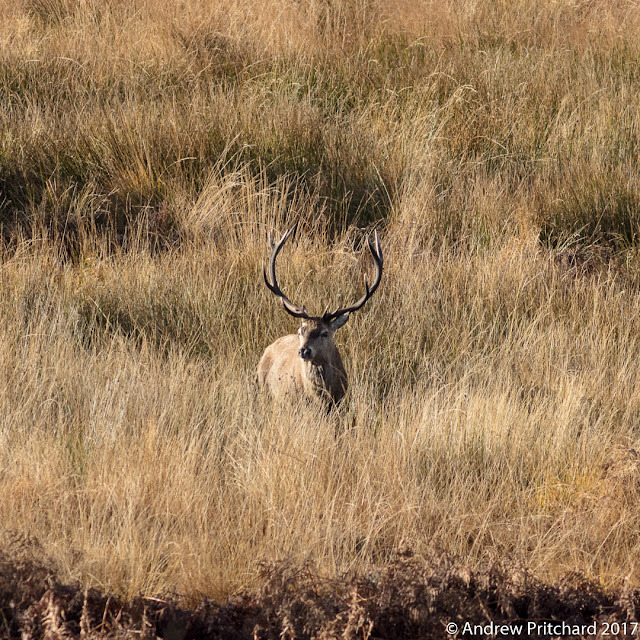 A stag stands alone in the long grass, as if using it for cover. It looks very boggy behind him, and I wouldn't be surprised if he was to merge from his area of cover with mud covered legs and under body. The deer prefer to travel along known routes for ease and safety, but a stag seeking other deer may just take any route possible.